Clamber inside the roll cage, strap yourself into rally seats, start the engine and floor it. In no time at all you are doing 60mph, slide sideways round the first bend and then blast along the straight. 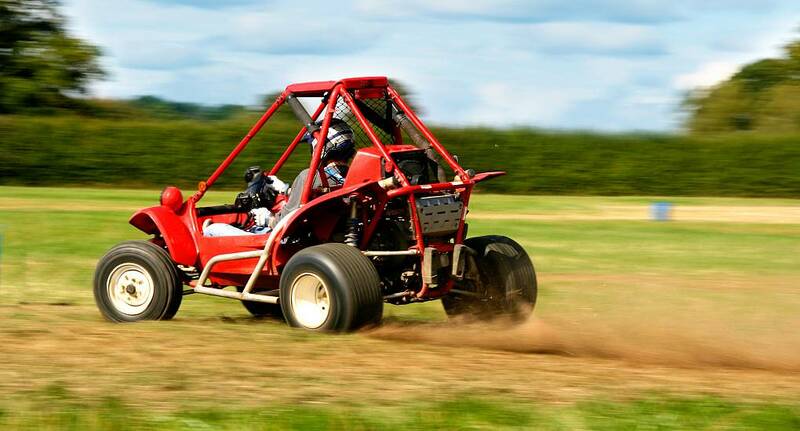 Rage buggies are extremely light and agile, designed with a great centre of balance, and the roll cage protects in the (highly unlikely) event of rolling over. They are built for all weather racing. Go careering round the bends, zoom over the dips confident that the chunky tyres will absorb whatever shocks are thrown at it. Race on gravel surfaces, where the track is fast and loose, or wet and muddy tracks, where even on dry days the course can be hosed for extra sliding.